My patients are my main priority and remain extremely important to me. I enjoy being able to help them return to happy, fulfilling lives. Dr. Alfred Hess is an orthopedic surgeon who specializes in disorders of the upper extremity. He began his practice with Florida Orthopaedic Institute in March 1995. Prior to Florida Orthopaedic Institute, Dr. Hess was a full-time physician with the University of South Florida. He is a native of Ohio and a graduate of John Carroll University. He received a Master of Science Degree at Case Western Reserve University in Cleveland. He graduated from the University of Cincinnati College of Medicine in 1985 and completed his residency in Orthopaedic Surgery at the University of Pittsburgh College of Medicine. Dr. Hess then completed a year of fellowship training in Hand and Microvascular Surgery at the University of South Florida. Dr. Hess is board-certified by the American Board of Orthopaedic Surgery and also has attained the Certificate of Added Qualification of Hand Surgery. He is a member of the American Academy of Orthopaedic Surgeons and the American Society for Surgery of the Hand. Dr. Hess is on staff at Shriners Hospital where he is the Director of Hand Surgery. Dr. Hess is also an active participant in the trauma service at Tampa General Hospital and is on staff at Columbia Brandon Medical Center. I was very happy with the service I received from Dr. Hess. His staff and assistants were also very helpful. I just had my second rotator cuff repaired this week. Dr. Hess communicated with me very well and took time to answer all my questions. I would recommend Dr. Hess to anyone needing his services. Dr. Hess and his entire team did a great job. I had immediate pain relief after the surgery. The entire process from the first visit to the last post-op visit was excellent. Excellent doctor and surgeon! He was right on with my son’s diagnosis (he had a rare condition in his right elbow). You will not get warm fuzzies from Dr. Hess if that’s what you’re looking for, but you will get a smart, thorough, knowledgeable surgeon who knows what he’s doing. I will take knowledge and expertise over warm fuzzies any day when it comes to picking a doctor/surgeon. Don’t get me wrong, he is a very nice man, just short and to the point. His P.A. Tony is equally awesome! On September 15th, I shot myself with a .45 hollow point bullet through my left dominant hand. The damage to my palm, joint and middle finger bones, tendons and nerves was extensive. You could put a roll of quarters through the wreckage of my hand. Dr. Miranda met me at the Brandon Regional Hospital Emergency Room and after assessment contacted Dr. Hess for consultation. Dr. Miranda through surgery stabilized my hand. Six weeks later, Dr. Hess recommended a digital resection as my best option. He explained that by removing the middle finger near the wrist and moving the index finger to the middle finger position I would stand the best chance for the greatest hand functionality. The surgery was a success and through coordinated Occupational Therary at the hands of Sue Mokris today five months later I can as examples: type, tie my shoes, grasp change handed to me, thread a needle and play catch with my grandchildren, all pain free and without limitation. The team at Florida Orthopaedic Institute always addressed my concerns and met every expectation I had with reasonable explanations and options. 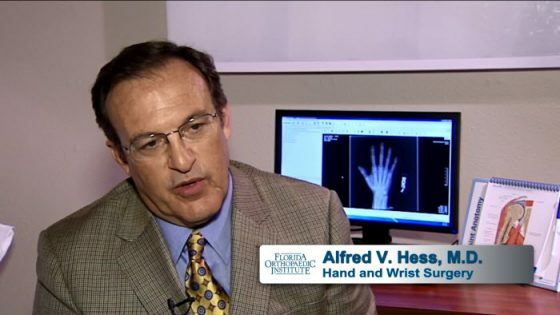 While I hope to never need their services again, if needed I will consult the professionals at Florida Orthopaedic and highly recommend Dr. Hess and his team for hand trauma. I’ve been his patient since 2000 and this past year due to car wreck , I have had 5 surgery’s with Dr. Hess. Because of him and his honesty and respect. I can use my arms as best as possible. I love him and his staff. Tony and Ebony are the best. They have such compassion for the patients and respect. Never had I had a better doctor.